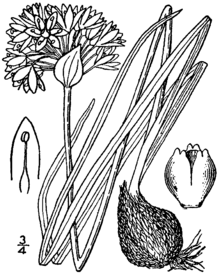 Allium textile (prairie onion or textile onion) is a common species of wild onion found in the central part of North America. 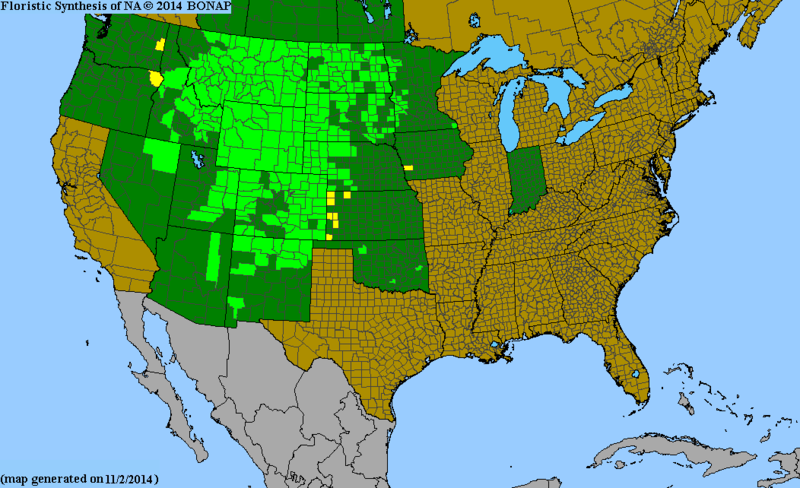 Its native range extends across the Great Plains states from Oklahoma to Montana and Minnesota, plus the Rocky Mountain and Great Basin states from northern New Mexico to Washington, plus the Canadian provinces of Alberta, Saskatchewan and Manitoba. There is also a report of an isolated population in Indiana. 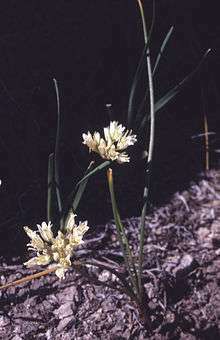 Allium textile grows on dry, sunlit locations at elevations of 300-2400 m. It produces egg-shaped bulbs up to 2.5 cm long. There are no rhizomes. Scapes are round in cross-section, up to 40 cm tall. Flowers are bell-shaped or urn-shaped, about 6 mm in diameter; tepals white or pink with reddish-brown midribs; pollen and anthers yellow. ↑ "Allium textile". Tropicos. Missouri Botanical Garden. Retrieved 6 September 2016. ↑ drawing from Britton, N.L., and A. Brown. 1913. Illustrated flora of the northern states and Canada. Vol. 1: 500. 1 2 "Allium textile". Flora of North America (FNA). Missouri Botanical Garden – via eFloras.org. ↑ "Allium textile". County-level distribution map from the North American Plant Atlas (NAPA). Biota of North America Program (BONAP). 2013. ↑ Nelson, Aven & Macbride, James Francis. 1913. Botanical Gazette 56(6): 470. ↑ Presl, Jan Svatopluk, & Presl, Carl Bořivoj. 1819. Flora Čechica 73. ↑ Fraser, John. 1827. Memoirs of the Wernerian Natural History Society 6: 36. ↑ Cronquist, A.J., A. H. Holmgren, N. H. Holmgren & Reveal. 1977. Vascular Plants of the Intermountain West, U.S.A. 6: 1–584. In A.J. Cronquist, A. H. Holmgren, N. H. Holmgren, J. L. Reveal & P. K. Holmgren (eds.) Intermountain Flora. Hafner Pub. Co., New York. ↑ Great Plains Flora Association. 1986. Flora of the Great Plains i–vii, 1–1392. University Press of Kansas, Lawrence. ↑ Moss, E. H. 1983. Flora of Alberta (ed. 2) i–xii, 1–687. University of Toronto Press, Toronto.